- Katie Koscinski, SFO, training coordinator. - Bob & Mary Stronach, SFO, hospitality-beverage & publicity coordinators. - Inquirer Joanne Lockwood, quality control coordinator. - Inquirer Rick Roberts and his wife, Rose Marie, volunteer coordinators. - Estelle Barton (friend of the fraternity). - Mary J. Schofield, SFO. - Dc. Gil Nadeau and Fr. Richard Dellos. - Bob and Donna Oderkirk, who head up food preparation. - Fred Rode and Karl Schmit, security and maintenance. - Bonnie Woods, community liaison. - Maureen Sciado, aid advisor. - Donna Nelson, Carmelite liaison. - Larry Martone, funding advisor. UTICA, NY -- Blessed Mother Marianne Cope grew up in West Utica and went on to devote the last 30 years of her life to the lepers of Hawaii’s Molokai. 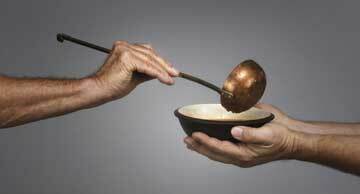 Now her name is being lent to a new effort to serve those in need in her home town, with the launch of a soup kitchen at St. Joseph-St. Patrick Parish Center at Varick and Columbia streets. 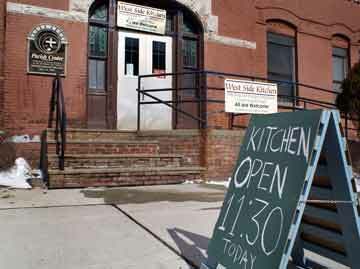 Called Mother Marianne’s West Side Kitchen, the all-volunteer operation serves soup and sandwiches from 11:30 to 12:30 Monday through Friday, and a bag lunch on Saturday. On Sunday the parish offers a coffee hour following the 10:30 Mass. 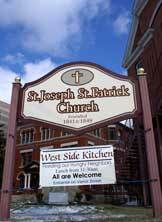 A coordinating group, led by Deacon Gilbert Nadeau, is the organizing force behind the soup kitchen. The group includes parishioners, friends of the parish, and members of the Secular Franciscan Order. He appealed to churches of all denominations to spread the word on the need for supplies, and for volunteers willing to devote one day a month. Mother Marianne’s West Side Kitchen opened its doors March 10, 2008.